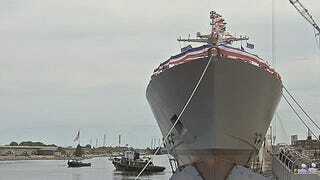 Lockheed Martin officially launched the Navy’s 9th Littoral Combat Ship, the USS Little Rock (LCS-9). The almost violent side-launching affair took place yesterday at Marinette Marine’s ship-building facility along the Menominee River in Wisconsin. The occasion included all the typical ship launching fanfare, including broken bottles of champagne and politician’s speeches. The LCS-9 still has the better part of a year’s work left to be done and testing to complete before she becomes an active player for the U.S. Navy, at which time she will be deployed for long periods to Singapore. Eventually, four Littoral Combat Ships will be continuously deployed there as part of the Department of Defense’s “pivot toward the Pacific” and to monitor and attempt to counter balance China’s growing claims on the South China Sea.